A quick recap of what I've worked on this month. First the finishes. I finished Put Your Red Shoes On, on Jan 1. I also finished a stuffed tree centerpiece and a felted penguin. In addition, I worked on several pieces, The Arab Tent, Mystical Wizard, The Accolade, Celestial dragon, and my Sunday project of 'insanity'. Mystical Wizard and Celestial Dragon are new starts for me. Wizard was a kit and Dragon was something I had kitted up earlier. Yay! Managed to keep on a project for a full week. And I will continue to work on it next week as well. I'm nearing the end of the first of four pages. Minus the over 1 symbol that will go in the open area in the square. 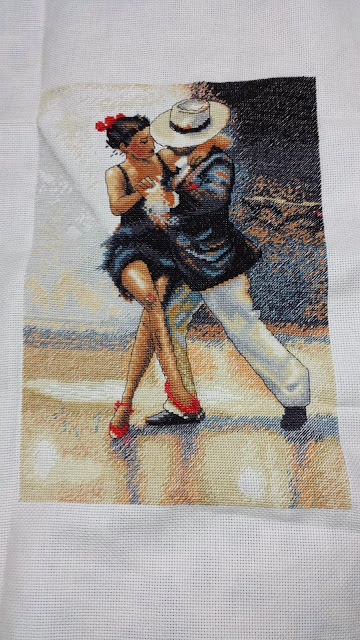 And of course all the backstitching and beading. 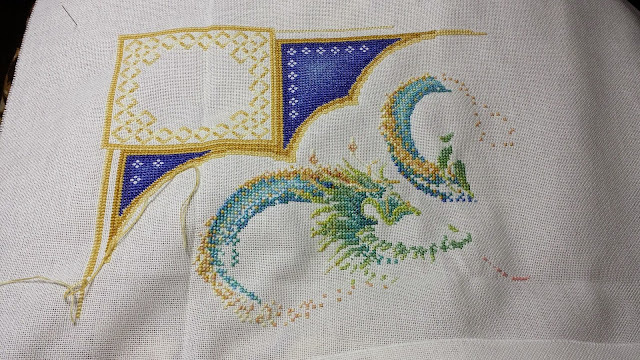 Everything between the dragon and the border has a backstitched grid and beads at the intersections. Forgot to add the video of my competition. I somehow managed to work on The Accolade for a week. Barely. On Thursday I got tired of it and switched projects. But I did manage to get down to row 118. I tried to hold on to finish 120 but couldn't. 13 rows until the end of the 2nd row of pages. Say hello to TW's Celestial Dragon. Or rather at the moment a tiny hint of dragon and most of the upper left corner border. For only using 29 DMC colors only 8 of those are actually used as solid colors. Everything else is blends. Update on my dancing. Friday, as I may have mentioned was my first competition with my new partner. We placed 17/23 in silver latin. I thought we should've at least made it to the semi finals but we didn't. Back to the studio for practice. A bit of good news, my mom bought me a new dress for next time. Similar in style to the roses one I made but leopard and I didn't have to spend time making it. My mom took video and I will edit it soon. I seem to be a bit all over the place this week. Let me walk you through it. Sunday, I have declared this day to be for 'insanity'. I shall try and keep this up. So Monday, I picked up a new cross-stitch, Mystical Wizard. More on that later but here are the colors. 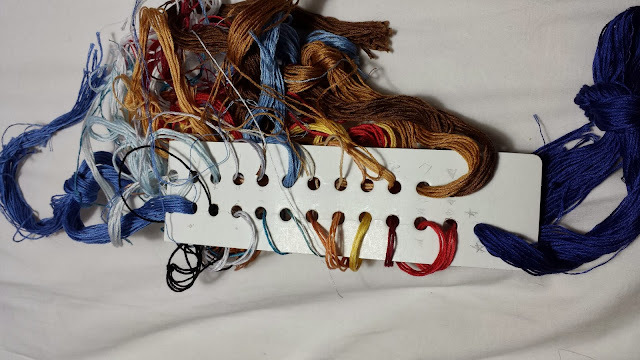 Wednesday, I decided to work on one of my sewing projects. A 17.5" stuffed Christmas tree. I was going to make the 12" one but I had enough fabric if I ignored the included cutting diagram and got away with 1/8" less. But come Thursday, I was tired of my cross stitch. There's only so much I could take of stitching blue on blue, and mainly two colors of blue. Of course the upper left is the least interesting part color-wise of this piece. So I switched to The Accolade. I'll include the last photo I took of it (with my old phone) because I didn't get that many rows finished. But not bad for only two days. The frog infested piece is complete! And so I ran my random number generator and came up with The Arab Tent. Anyone remember this one? I got about 20 rows done but I'm tired of the colors. Dark brown can be a bit depressing and the bottom few rows of the page are almost all black. For a bit of a change of pace, I decided on the felting kit I picked up prior to the new year. Behold my first (and last) attempt at this craft. I pricked my fingers more times than I would like. 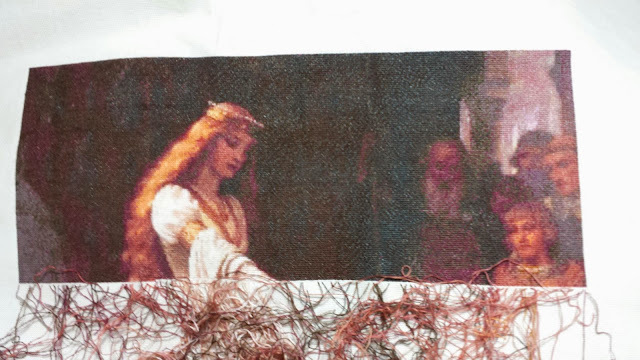 So I'll go back to my cross-stitch. I'll spend the day on Insanity before moving onto the next random number.